Low back pain can come from a variety of sources, but are you aware that one of the most common triggers of low back pain is tight hip flexors? Let’s look into the anatomy of this issue, the causes, and the solution. It takes multiple muscles to flex our hips, the dominant two being the iliacus and psoas major – together referred to as the iliopsoas. The iliacus runs down the front of the hip and inserts on the femur. The psoas major also inserts on femur and it wraps around to the back of the body, connecting to the lumbar spine, specifically to the T12 and L1-L5 vertebrae. When the iliopsoas shortens, or flexes, the knee is brought up toward the chest. When discussing this issue, it is important to remember that muscles that remain in their shortened position for prolonged periods of time tend to stay shortened, or “tight,” when they are given the ability to lengthen. A tight iliopsoas that has been in a shortened position will resist lengthening, resulting in pulling on the spine, compressing the disks and causing stress. This will begin to limit the mobility of the spine. Over time, this can lead to serious pain or tightness in the low back, sometimes accompanied by pain or awareness of tightness in the hips. Tight iliopsoas muscles are common in bikers and runners. Knowing the anatomy and physiology of the hips as described above, this makes sense! These athletes are pulling their knees toward their chest with every step or peddle. However, the muscles do not need to be actively contracting to tighten in the shortened position. When we sit at a desk, drive a car, or sleep in the fetal position our iliopsoas is in the same contacted position as someone who is out running or biking. Unfortunately the average person sitting or sleeping doesn’t think to stretch out these muscles because they aren’t usually sore, leading to tightness and pain in the spine over time. Thankfully, this issue can treated and maintained to eliminate pain. Chiropractic adjustment is crucial to prolonged relief from tight hip flexors. As the iliopsoas compresses the spine over time, the joints lose their mobility. This causes the muscles to tighten even more, forming a splint of sorts for the immobilized spine joints. An adjustment will get the joints moving correctly, allowing the muscles holding them in place to release. Stretching is then more effective as the muscles have a greater ability to lengthen when they are not being told by the brain that they are needed to stabilize the spine. Not only does pain often immediately decrease following an adjustment, a chiropractor will work with you to eliminate the dysfunctional patterns causing the issue, not just relieve the symptoms. biomechanics throughout the lower body. There are multiple methods to stretch the iliopsoas muscles; two of the most effective are deep lunges and foam rolling. To perform the lunge stretch, begin by kneeling on the floor. Place one foot on the ground with the knee stacked over the ankle. The knee that is still on the ground should be at an angle slightly more than 90°. Be sure to keep the hips square to front of the body. Keeping the upper body straight, gently push the hips forward. Perform this stretch 3-5 times per day on each side. Another passive way to release the hip flexors is to foam roll the area. This massages the muscles, increasing circulation and oxygen flow and releasing tension. 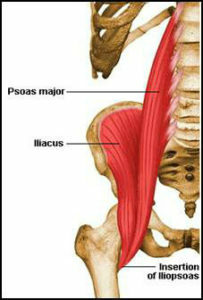 Here is a link to a YouTube video on the proper method of rolling the psoas muscles. The most important therapy to treat and prevent tight hip flexors is to stand up and move around! If you work at a desk or drive frequently, make sure to get up and walk around at least once an hour. Bonus points if you perform any iliopsoas stretches while you are up! Tight hip flexors are a major cause of low back pain. Hip flexors can become tight from running, biking, and most importantly: sitting for prolonged periods. To relieve back pain caused by this issue, visit us for an adjustment to mobilize the lumbar spine and STRETCH your hip flexors! Prevention is key! Make sure to stand up at least once an hour and move around to lengthen your iliopsoas. If you have any questions regarding this post or think you may be suffering from tight hip flexors, call us at the office at 615-650-6533. We would be happy to tell you more, demonstrate stretches or foam rolling techniques, and help you get rid of your low back pain.